Bluetooth View is a handy little utility which runs on your computer, warning and notifying you when a Bluetooth device has come into range. It can show various details about the Bluetooth device including the type of device (a phone, a keyboard, a mouse, another PC, etc), the MAC address of the device among some other details like the maker of the device, the Bluetooth address, last time the device was in range and more. The application is developed as freeware by NirSoft and can be quite useful to anybody wishing to see exactly what devices are within range. It was probably created because Windows natively lacks such an application. Version 1.66 is a freeware program which does not have restrictions and it's free so it doesn't cost anything. 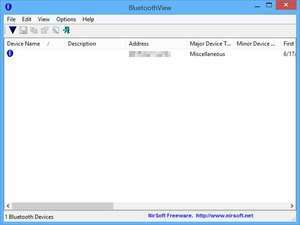 For security reasons, you should also check out the BluetoothView download at LO4D.com which includes virus and malware tests. Additional screenshots of this application download may be available, too. BluetoothView has a presence on social networks.